This is the second in a series of blog entries exploring the metrics used for assessing dominance hierarchies: see the introductory post for the rationale behind doing this, with other metrics visible through the index page. Clutton-Brock et al. (1979) were interested in giving a metric to fighting success in red deer stags, where individuals were studied over long periods of time. 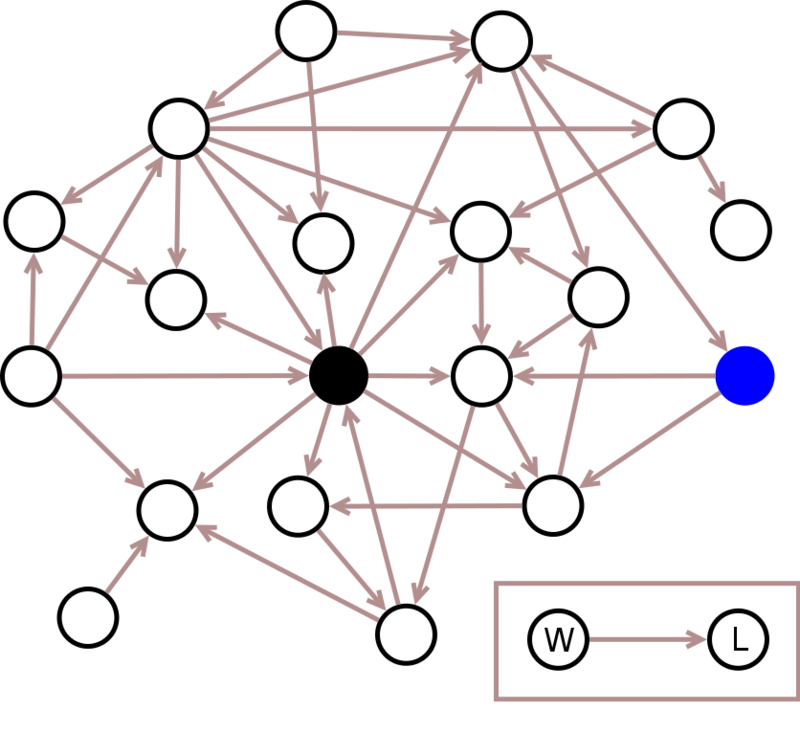 Studying any network system over longer periods of time is going to cause a problem, as the status of individuals may change during that period (see Rands 2014 for some discussion of this problem), and the authors of this paper were aware that a male’s dominance could change within a mating period as his energy levels flagged or he became injured. Simply counting the number of fights won and lost will not give a very accurate reflection of how an individual is placed within the herd, as his success is also going to depend upon the idntities of the individuals he beats: a male who consistently fights and wins against weak opponents is not necessarily going to be of similar quality to a male who consistently fights and wins against strong opponents. So, Clutton-Brock and colleagues designed a simple metric that takes account of the quality of opponents individuals win and lose against. Figure 1: all winner/loser interactions within a group. As depicted in the box, the arrow denotes which individual is the winner W or loser L in a connected pair. To gauge an individual animal’s fighting success, you need to calculate B, the number of other animals that the focal individual has won against, and note the identities of all the losers. For each of these marked losers, you also need to calculate the number of individuals that they in turn have beaten, and sum these to give Σb. Because we define one individual in an interacting pair as a winner, and the other a loser, this means that none of the summed interactions contributing to Σb are against the focal individual. As well as assessing wins, you also need to calculate L, the number of other individuals that the focal loses against. These winning animals are marked and the summed number of animals that they themselves lose against is calculated, giving Σl. where the “+1” term on both the top and bottom of the equation allows a meaningful metric to be calculated for individuals that are either never seen to win or lose. Following Figure 2, we see that B = 8, Σb = 2 + 2 + 2 + 1 + 1 + 0 + 0 + 0 = 8, L = 3, and Σl = 2 + 2 + 0 = 4. So, DCB = (8 + 8 + 1)/(3 + 4 + 1) = 2.125 for the black individual. Similarly, using the reasoning given in Figure 3, DCB =1.167 for the blue individual. A larger value of DCB will notify a greater fighting ability, and the maximum size of the statistic within an observed group is going to depend on both the size of the group and the maximum number of other animals that each individual in the group interacts with. In their original paper, Clutton-Brock and his colleagues found DCB for red deer ranged between 0 and a little over 3. This is a simple statistic to compute, but I would caution that it should really only be used for comparing individuals within a group, given that it is dependent upon both group size and number of interactions recorded. The metric is also dependent upon observed relationships being fixed: an individual that wins an interaction will always win future interactions with the same opponent. This suggests that caution should be used if this metric were to be transferred to observed interactions where the dynamic between a dyad could change over time. Technical Note: The network diagrams were drawn on a Mac with Dia Diagram Editor (open source freeware), and coerced into nice smooth images with GIMP (GNU Image Manipulation Program: open source freeware). This is the first in a series of blog entries exploring the metrics used for assessing dominance hierarchies. The previous introductory post explains the rationale behind doing this. An index page will give detailed links to other metrics within this blog. I’ll start with giving details for how to calculate the Dominance Index metric described by Zumpe & Michael (1986), which uses counts of agonistic encounters to generate individual scores, which can then be used to suggest a hierarchy. Using this technique is possible with pen and paper, so I may be giving a bit more detail of the nuts and bolts than I will with some of the more complex metrics. This technique is intended to give the user a ‘cardinal ranking’ – rather than just sorting the interacting individuals into a ranked order, this technique provides a way of assigning each individual a weighting statistic. The authors suggest that this could be useful for assessing how individual dominance changes over time, if different datasets are used. For example, A directs aggression towards H on seven occasions. Note also that no aggressive interactions are observed between G and K.
For example, H displays submissive behaviours to G on 11 occasions. Note also that no submissive behaviours were recorded between H and K.
65.3% = (55.6% + 75.0%) / 2. Finally, the Dominance Index for each of the group members is calculated as the mean of the averages calculated for each focal individual, as given in table 5b. For example, the dominance index for A is calculated as 73.4% = (65.3% + 69.2% + 85.7%) / 3. From this, we can use the Dominance Index rankings to construct a hierarchy. 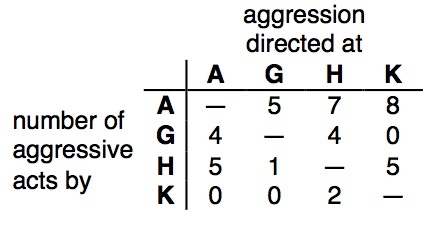 In this case, A > G > H > K.
The metric falls apart when there are no aggressive or submissive acts recorded within a pairing, which means that no average score can be recorded in table 5a. This could potentially be remedied by observing the interacting individuals until some agonistic interaction is recorded, but it may be that the non-interacting individuals are able to assess each other without needing to interact (using alternative cues, or through recognising each other from earlier unrecorded interactions). This metric is therefore not ideal if some individuals do not interact with others. Similarly, a dataset which records few interactions between individuals may be biased by a few anomalous recorded encounters. However, using mean percentages (as calculated in table 5b) removes biases that could be introduced by simply scoring the overall number of ‘wins’ in dyadic agonistic encounters for each individual, which may be incorrectly inflated by many interactions with a small subset of the group members. I’m also curious to see what happens when a group consists of two or more subgroups where interactions tend to be within rather than between subgroups. Many interactions between group-living individuals can be influenced by hierarchies that exist between the interactors. These interactions can be measured in lots of different ways, and once measured, whatever has been scored needs to be processed to give a reproducible estimate of the shape of these interactions. What this means in practice if you’re starting a new project with a new study organism is that you spend a lot of time thinking about what behaviours to record, and how to record them, but don’t really give consideration to the means of crunching these numbers down to something meaningful at the end. Good experimental design implies that the analysis has been considered during the design of the experiment, but this intermediate stage of generating ‘raw’ information about any hierarchies that are in place may be left out, meaning that something has to be cobbled together post hoc after the work has been done. This is never ideal! Having supervised a fair number of projects where exactly this has been done, I’ve decided to try and get my head around the various statistics out there that are designed for assessing and ranking hierarchies. Some of these are fairly straightforward, and some are slightly more involved, dipping into social network analysis and other emerging fields in animal behaviour. To make this a useful exercise, I’ll attempt to put together a how-to guide for using them, aimed at researchers with a mixed range of skills in manipulating numbers, and where time permits, I’ll try and add in some practice examples. How well this works depends upon both my own understanding, the time I have available, and the limitations of inputting maths into a WordPress blog! What I won’t be doing (at least, initially) is being particularly critical about which techniques work best: this is a voyage of discovery for me too! I also won’t be focussing on what dominance is for, why it exists, and how it does or doesn’t drive particular group behaviours (but I do discuss how leadership decisions don’t necessarily depend upon the hierarchy present in Rands et al. 2008 and Rands 2011). This series of blog postings will take a little time to put together (An index page will give detailed links to other metrics within this blog), so if you’re looking for general advice on the sort of indices that are out there, I strongly recommend hunting down a copy of the excellent book by Hal Whitehead (pages 186-195 in particular).